Are you in search of brilliant color for your engagement ring? Do you appreciate clean lines, modern styles, and American-made jewelry? If so, may we recommend this magnificent Jose Hess tsavorite garnet wedding set? Crafted of solid 18k white gold, this gorgeous wedding set features rounded bands lined with nearly 40 flush-set, round brilliant white diamonds. Geometrical engravings add luster and interest to the bands. 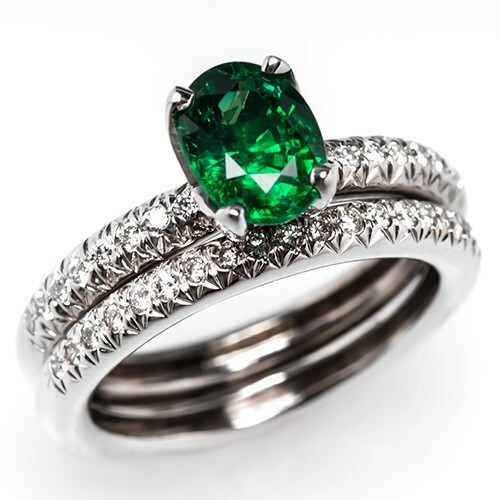 Mounted in a four-prong claw setting, a single green tsavorite garnet weighing 1.61 carats takes center stage. The gemstone is a beautiful oval cut. This designer ring demonstrates the modern elegance closely associated with the Jose Hess brand. Jose Hess jewels are best known for their inclusion of fiery brilliant white diamonds, contemporary styles, dazzling brilliance, and masterful designs. Each Jose Hess ring is guaranteed to please with modern lines, excellent craftsmanship, and a superior use of white diamonds. Jose Hess began his career in Colombia, South America, where his parents relocated during the Nazi invasion of his birth country Germany. After serving alongside his parents in the family's bakery throughout his early childhood, Jose went on to sweep floors in a nearby jewelry factory. Before long, he learned to melt gold and hand-set jewelry. To him, this was just rote work, a job to keep him busy and earn some pocket money. That is, until he discovered the artistry behind the jewelry. By the time he turned 17, Mr. Hess had caught design fever. Soon after, he left Colombia, arriving in New York in 1951. At night he went to school, taking classes in everything from accounting to art. He also took a correspondence course with the Gemological Institute of America. During the day, he worked for various jewelry firms, learning the techniques and practicing the skills he would later use to launch his brand into the forefront of American jewelry design. Eventually, he landed a position with accredited jewelry designer David Webb. After two years with Mr. Webb's firm, Jose Hess launched his own brand, fighting tooth and nail for American designers to be noticed and respected by retailers and consumers alike. At the foundation of Mr. Hess's design philosophy is his attention to the needs and interests of his retail jewelry customers. During the 1980s, his designs catered to sophisticated business women who loved lavish pieces heavy with diamonds. Today, his pieces tend to be more subtle, favoring the simple elegance of everyday jewels that can be worn by day or night by almost any woman. Jose Hess is celebrated as one of the first designers in what is today known as the American Jewelry movement. At its core, American Jewelry is largely defined by the absence of a set of design standards. Whereas European jewelers follow a certain code, using techniques handed down for hundreds and hundreds of years, American jewelers are afforded a higher level of creativity in the application of their techniques. While many of these traditional techniques are mastered by American jewelers, the US jewelry industry allows designers the freedom to apply these age-old techniques to new materials and to refine the techniques to bring a decidedly contemporary feel to the old ways. Jose Hess has distinguished himself as a master in the art of contemporary American design, using clean lines, lots of brilliance, and statement color (if color is used at all). If you are a modern woman, ready to walk down the aisle wearing only the finest in American craftsmanship, then we suggest you look no further than this Jose Hess tsavorite garnet bridal set. Call today to make your appointment to visit our Seattle-area showroom.